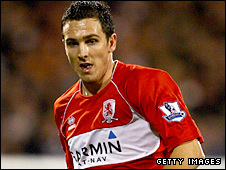 Middlesbrough say they have rejected a written transfer request from unsettled winger Stewart Downing. Downing, who has 21 England caps, signed a new five-year deal in February 2008 but has become increasingly frustrated with the club's struggles. Tottenham Hotspur had a reported bid of £6m for the 24-year-old rejected by Middlesbrough last week. Manager Gareth Southgate has repeatedly insisted that local boy Downing would not be sold. And chief executive Keith Lamb said: "We received a written transfer request from Stewart this morning. It was considered before being rejected. "Prior to receiving the transfer request, we received an improved offer for Stewart from Tottenham. "We immediately rejected this offer and informed Tottenham that Stewart Downing is not for sale and any further interest they have in the player will not be entertained." Chairman Steve Gibson added that no senior player would be leaving in the January transfer window. The Teesside club are under no financial pressure to offload one of their most prized assets but Southgate is not thought to have been previously aware of Downing's desire to leave. But Downing's father, Stewart Sr, told Middlesbrough's Evening Gazette: "Stewart's been frustrated since the summer, really. "When he signed his new contract he was assured that there would be significant investment in the squad. "He feels that the club haven't matched those expectations. He's also frustrated that the team is once again struggling in the Premier League. "Obviously as a Middlesbrough lad, he's thought long and hard about the decision to hand in a transfer request, and he also hopes the fans will understand his reasons for doing so." He's also frustrated that the team is once again struggling in the Premier League. Southgate's view may now become similar to the scenario involving Yakubu when he made it clear his future lay away from the Riverside Stadium and he was swiftly allowed to leave. The Nigeria international was sold to Everton for £11.25m in August 2007, with Southgate saying he felt the striker was "struggling emotionally" and playing below his best as a result. Southgate said at the time: "When a player is unsettled to that point, it's time to get the best possible deal for the club." Boro's valuation of Downing is nearer £15m, which would smash their record transfer sale, but it remains to be seen if Spurs will have the same opinion.